Deluxe Edition with five bonus tracks. 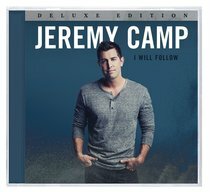 February 2015: Jeremy Camp returns with a powerful collection of new songs, I Will Follow. In the months following the release of his autobiography, I Still Believe, many fans approached Jeremy, wanting to know how he dealt with the loss of his wife. Their questions led him to pen the lead single, 'He Knows'. "We all experience different types of hurts and struggles... I have experienced major hardship in my lifetime as well. The one thing we can always count on is the fact that even if no one else understands what we are going through Jesus himself has walked the pain and suffering so 'He Knows.'" In an incredible decade-long career, Jeremy Camp has earned accolades that most artists only dream about. The list includes 5 RIAA Gold albums, over 3.5 million albums sold, a Grammy nomination, 3 American Music Award nominations, 5 Dove Awards, 4 ASCAP 'Songwriter of the Year' Awards and a total of 32 Number 1 radio hits across all formats. About "I Will Follow Deluxe CD"
Customer Reviews For "I Will Follow Deluxe CD"
Review of "I Will Follow"
Three singles deep already, now Capital Records has finally released Camp's most anticipated new release "I Will Follow." Every single that has come out of the chute prepping for the album's release has been eagerly devoured by radio and fans. In fact, at the time of writing, Camp's "He Knows" has already crack top 10 on Billboard's Hot Christian Songs chart. And it looks like there's no stopping "He Knows" from cracking top 5. If you have taken a fancy to Camp's radio singles hitherto, you'll love this new release. Just like the singles, every track here is power jammed with gigantic hooks and big anthemic-sounding chorus that will get those who like their Christian songs on the pop-rock side a la Matthew West and Casting Crowns elated with bliss.If there's another thing to gripe about, it's in the percussion department. The edgy electric drum sound somehow gets in the way, drowning out the melody of "Here I Am," a ballad that cries out for a simpler backing. And this again is the problem to "Til the End."